Verbal understanding (śā bdabodha) of any utterance requires the knowledge of how words in that utterance are related to each other. Such knowledge is usually available in the form of cognition of grammatical relations. Generative grammars describe how a language codes these relations. Thus the knowledge of what information various grammatical relations convey is available from the generation point of view and not the analysis point of view. 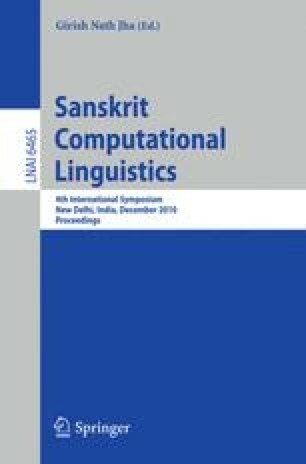 In order to develop a parser based on any grammar one should then know precisely the semantic content of the grammatical relations expressed in a language string, the clues for extracting these relations and finally whether these relations are expressed explicitly or implicitly. Based on the design principles that emerge from this knowledge, we model the parser as finding a directed Tree, given a graph with nodes representing the words and edges representing the possible relations between them. Further, we also use the Mīmā ṃsā constraint of ākā ṅkṣā (expectancy) to rule out non-solutions and sannidhi (proximity) to prioritize the solutions. We have implemented a parser based on these principles and its performance was found to be satisfactory giving us a confidence to extend its functionality to handle the complex sentences.